Although Halloween isn't officially until next week, as most children will still be on half term my son's school hosted their Halloween Disco last Thursday! So this was to be Ben's first proper Halloween party! I was slightly worried as he has always had quite a considerable fear of anyone dressed up! We have not been able to visit Santa's Grotto since his very first Christmas (when he was just 4 months old and didn't really know what was going on!) and our trips to see his favourite characters such as Peppa Pig and Fireman Sam have always ended in disaster with a screaming child clinging to me for dear life! But over the past few months he has improved, although he still gets a bit funny if he sees some totally dressed up with their head covered, he's much better with normal dressing up costumes and I think we may even be able to attempt a Grotto this Christmas! So after deciding he was brave enough to go, Ben needed a costume for the disco. 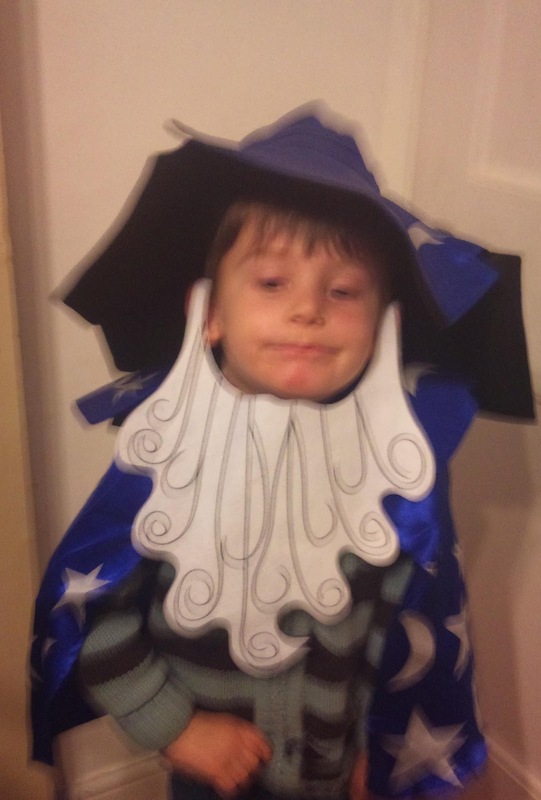 As you may remember we ran a great competition with Fancy Dress Outfitters earlier in the month and they were kind enough to send Ben a costume for the disco and for us to review! While browsing through their website I could not believe the vast array of costumes they had! The choice in both Adults and children's Halloween costumes is extensive! Knowing that Ben would not want to wear a mask or have his face completely covered I narrowed the choice down to a few I felt were suitable and let Ben choose. I was not surprised when he chose the Wizard! The costume arrived very quickly and was well packaged. Inside the postal packaging the costume had it's own resealable bag that fastened with poppers which is ideal for storing it between uses! 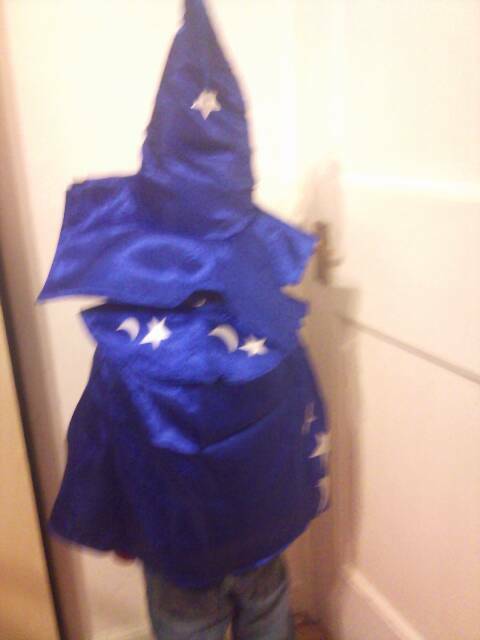 The Smiffy's Wizard Costume we ordered came in 3 sizes to fit children from 3 - 9 years. As Ben is a rather tall 4 year old we have chosen age 4 - 6. 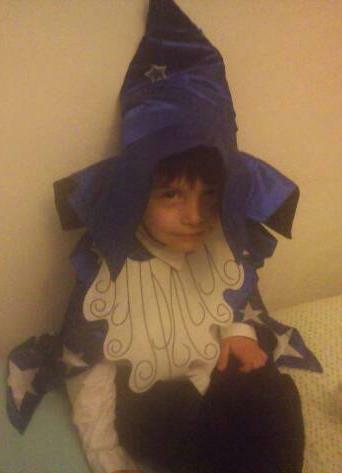 The costume itself consists of three pieces, a blue hat with two stars and a moon printed on it and a star dangling from the top, a blue cape with a collar, fastening at the front with velcro, again decorated with stars and moons and a beard that has two velcro tabs to attach it to the hat. 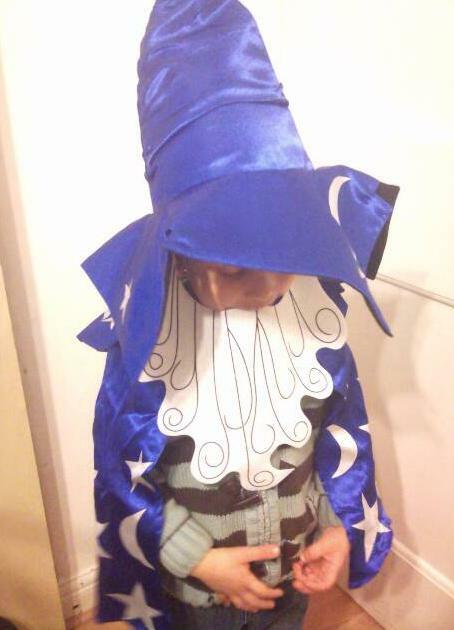 I really do like this costume, it is good quality, folds up small to store and can be worn over normal clothes. It should also fit be a while so will get plenty of use! With it being a wizard costume it is not unique to Halloween so can be used on other occasions when Ben can wear fancy dress. (and I'm sure it will be regularly used to 'dress up in' when playing at home too! For £13.09 this costume is great value for money! We are going to a local Halloween festival on Sunday so Ben will be wearing this again and I'll share some more pictures then! Fancy Dress outfitters are the one stop shop for fancy dress costumes and all things party! They offer a fabulous selection of children's and adults costumes and accessories for all occasions and to suit all budgets! With costumes starting from under £10 and sizes suitable from 1 year up to 14 years (and adults too!) they really are the ideal solution! Buying a costume is much more cost effective than hiring one as it can be used again and again and even passed down to younger siblings! 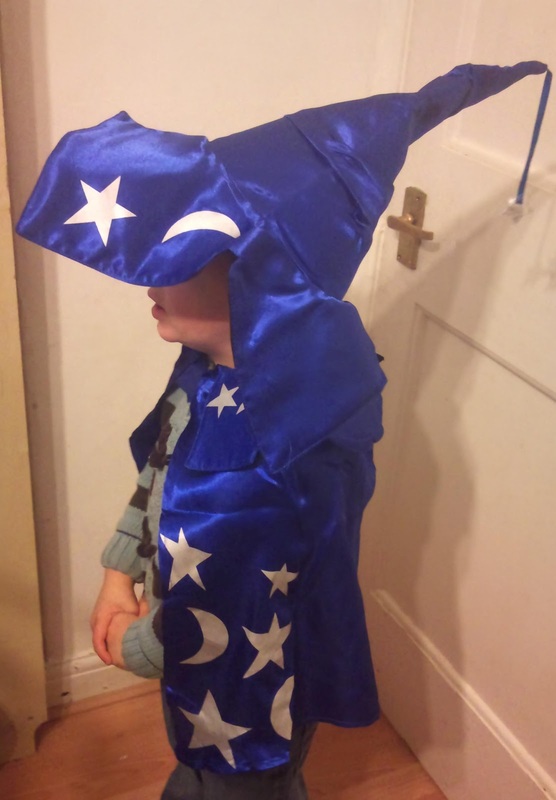 Fancy Dress Outfitters have delivery starting from just £3.59 (or FREE for orders over £50) and if you've left it until the last minute then they also have a next day delivery option available too! So the costume was sorted we just needed to make a contribution to the disco! These are the choices we were given... buy a raffle prize, put up some decorations, before the disco, tidy up afterwards, help out during or provide some cakes! 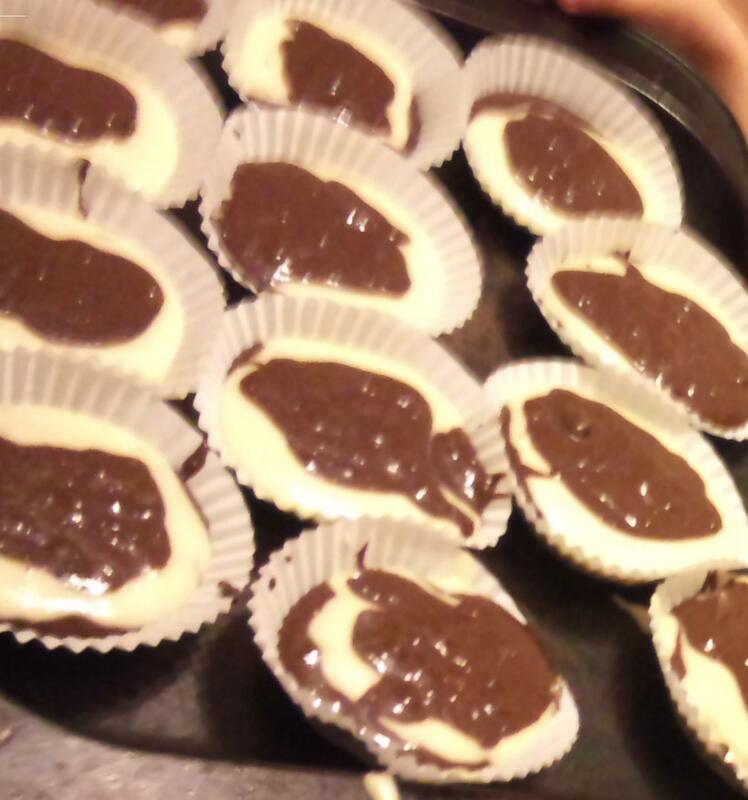 As lack of childcare ruled out some of these I decided Ben and I would have some fun making cakes together so After school on Wednesday we decided to make some Spooky Halloween marbled Ghost cakes! These are really simple to do and taste yummy! 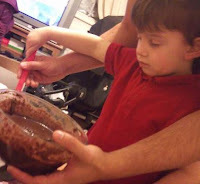 You simply make two separate mixes of sponge cake, one vanilla and one chocolate, then spoon them together into the cake cases! The mix it to create a funky marbled effect! After baking for 15 minutes and leaving to cool, we added a haribo ghost sweet to each cake on top of some gory red icing! 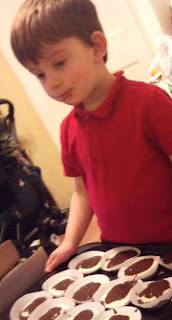 Ben had lots of fun making these and couldn't wait to take them to school the next day!